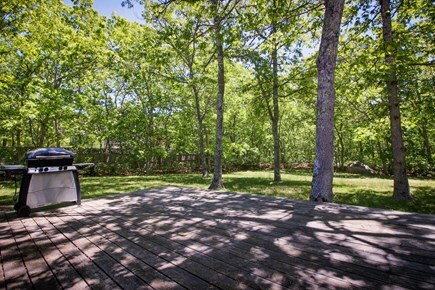 Recently renovated, this Edgartown home has two decks and a wood stove, making it the perfect spot for a vacation! The neighborhood is quiet and residential, but that doesn't mean there isn't fun to be had. Manuel F. Correllus State Forest is only four miles away and Joseph Sylvia State Beach isn't much farther. 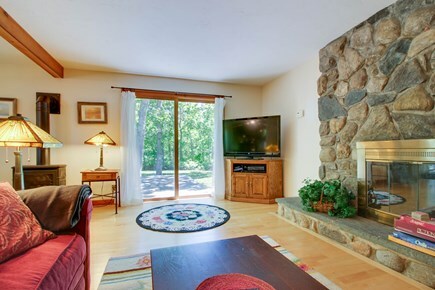 The comfortable living room has a large sectional sofa and cable TV. 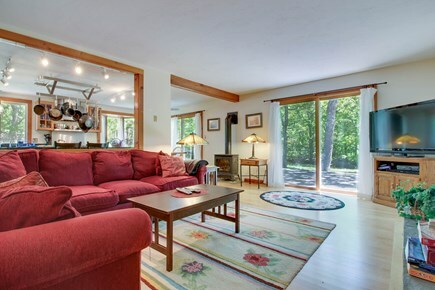 You can head out onto the deck via the sliding glass doors, too. 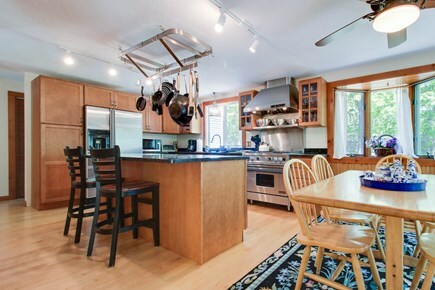 Prep your dinner in the gourmet kitchen with its high-end appliances, including a stainless steel stove and dishwasher. Enjoy your home-cooked meal at the five-seat dining table, two-seat breakfast bar, or the deck with its gas grill for summer BBQs. 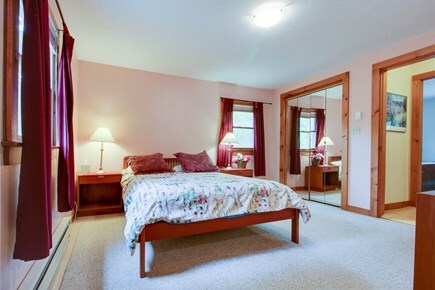 You'll find three bedrooms that offer plenty of space for all eight guests. 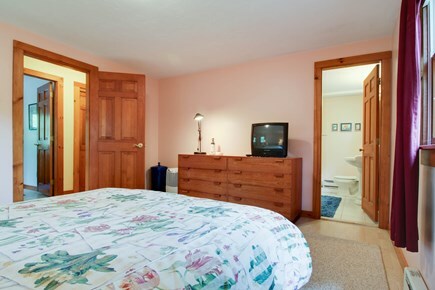 The master suite has a queen bed, modern furniture, and an en-suite bath. 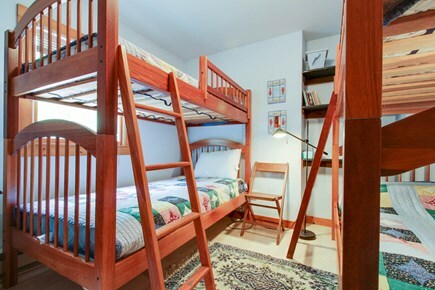 A second bedroom has four twins in two bunk beds, and the other bedroom has two twin beds. There's also another full bath nearby. 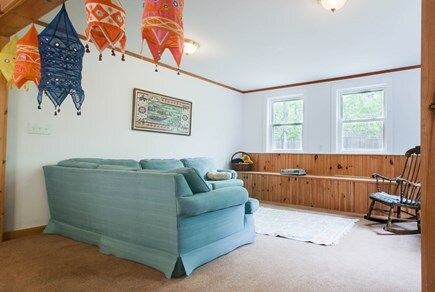 Enjoy the playroom/family room. 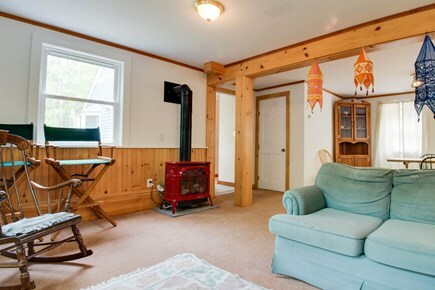 You can relax on the blue sectional or play a game by the wood stove. 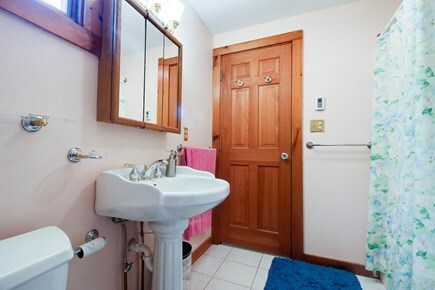 You also get a washer and dryer, free WiFi, a DVD player and library, a beach umbrella, and three beach chairs. Head to Edgartown for great boutique shopping and eateries. 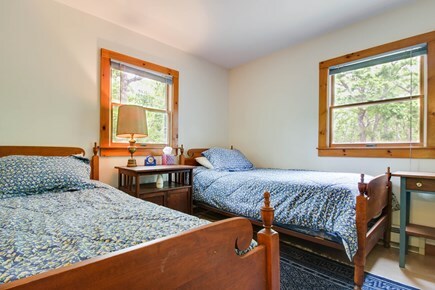 There are also nature preserves and wildlife sanctuaries nearby for outdoor excursions. 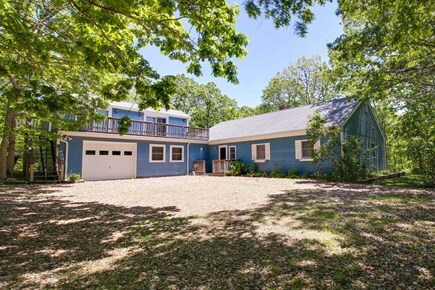 Enjoy the lovely confines of this bright and cheerful Martha's Vineyard home! Additional pricing info: For real-time pricing information, including the cleaning & booking fees, please contact Vacasa. State and local taxes of 9.7% will apply. Home was perfect for the price point. Great for two small families to share or by yourselves. My group of 8 loved staying in this gorgeous house, and only wish our stay had been longer! 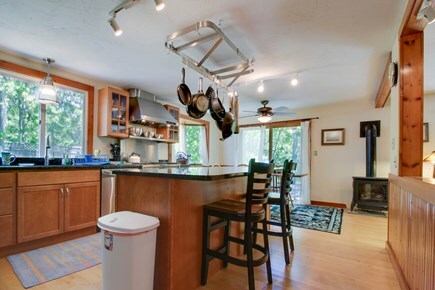 There was a modern kitchen with an open layout looking into the living room, which I had not appreciated from the pictures. Everything was very clean when we arrived, and we appreciated the extra beach towels available. Would definitely stay here again! Extremely clean and spacious house. Located a quick cab ride from downtown. 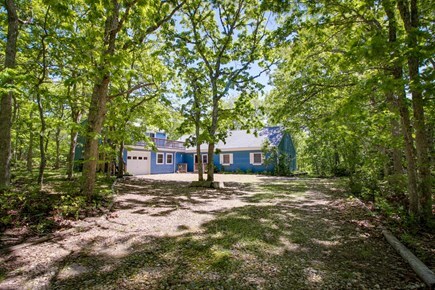 Great spot, great neighborhood, close to amenities and the beach. Highly recommended! The house and surrounding area was everything we were hoping for! The house is in a quiet neighborhood, but it is also just a short Uber ride to the center of town.